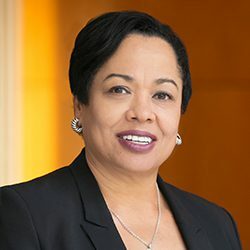 Grace E. Speights handles high proﬁle and high stakes workplace matters for many clients and is often called upon by clients for crisis management assistance. She defends clients against employment discrimination claims — particularly class claims — and claims of discrimination in public accommodations. Grace represents clients in systemic investigations and litigation brought by the Equal Employment Opportunity Commission (EEOC). She also counsels on best practices for corporate diversity initiatives. Grace is the leader of the ﬁrm’s labor and employment practice, managing more than 250 lawyers across the ﬁrm. Grace leads the ﬁrm’s multidisciplinary workplace culture consulting team of more than 30 lawyers across oﬃces and practices. Combining employment and workplace law experience with investigative expertise, this team helps employers effectively investigate, defend against, and develop advance plans to avoid or minimize workplace crises stemming from claims of sexual harassment. Grace has worked with clients in the ﬁnancial services, media and entertainment, sports, retail, nonproﬁt, and legal services industries to manage serious internal investigations, conduct workplace culture assessments, and advise on crisis management and remediation of potential workplace issues. Grace has also conducted independent investigations of allegations on behalf of special committees of boards of directors and is counseling boards of directors and high-level executives on their responsibilities in connection with providing a sexual harassment–free workplace.